Your cat is meowing again. Is she trying tell you something? Or is it just noise? Do her meows equal human words? 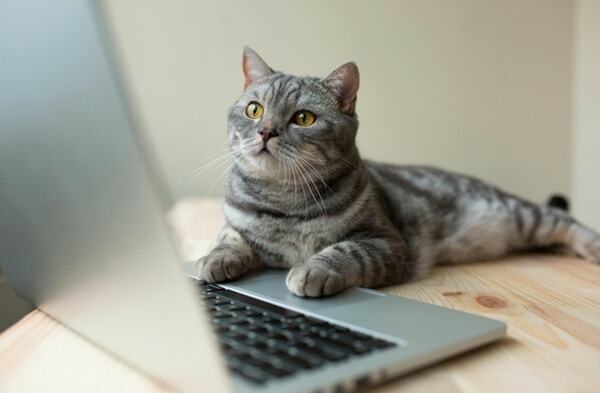 And most important, how can you communicate back to your cat? 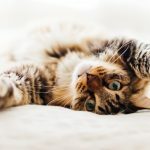 Let’s talk about why cats meow and what meowing means for you and your cat. 1. Cats speak a puzzling language. 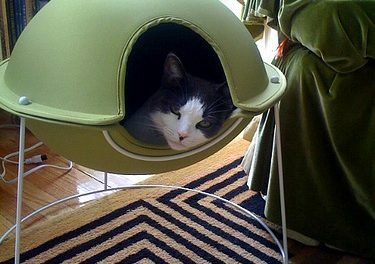 Like humans, cats send and receive messages in a variety of ways. An estimated 70% of human communication is non-verbal. Cats also make their feelings and needs known with their eyes and posture as well as with sounds. They can communicate using their tails (an erect tail signals happiness) and their back fur (raised hackles indicate serious emotion). But cats also use their vocal range to share their needs, thoughts, and feelings with the world. In fact, cats can make at least 100 distinct sounds, including 19 variations of meowing. 2. Their views of humans may explain why cats meow. Although English speakers learn as children that a cat says meow, most cats don’t actually meow to each other. Kittens use the meowing sound to tell their mothers they are hungry, scared, or cold. 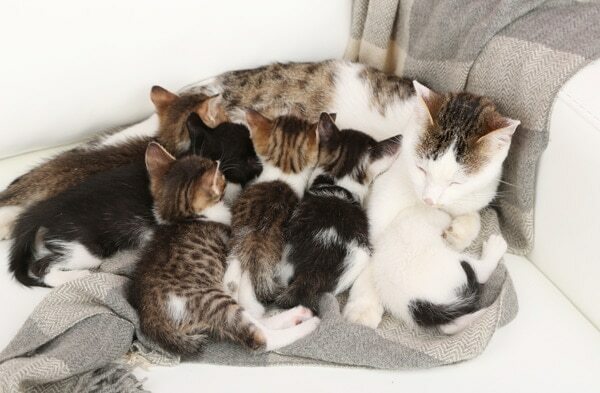 For wild cats, though, meowing ends when the kittens separate from their caregivers. Meowing is probably cats’ way of getting first their mothers and then their humans to do what they want. When meowing to humans, cats may be extending a greeting, or they could be asking for food, attention, or an open door. Elderly cats may meow due to cognitive disorientation, a condition that affects feline brains much as Alzheimer’s impacts the human brain. 3. Other than meowing, how does a cat communicate? 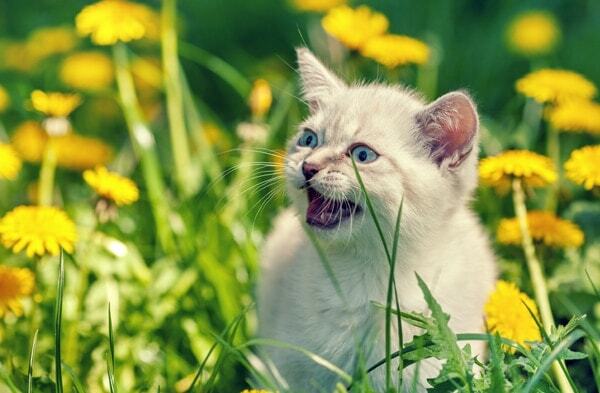 Meowing is not most cats’ natural communication style. 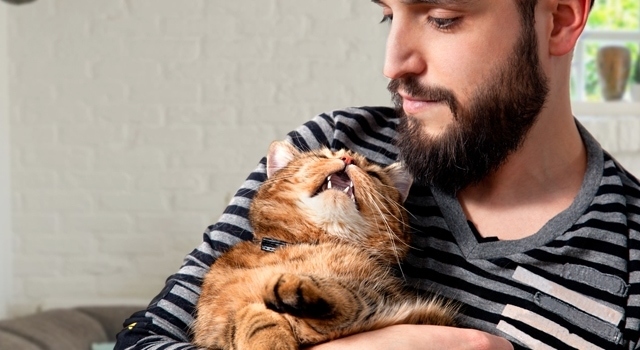 Humans rely on vocalization, and cats probably picked up that trait from us. Their strongest sense, however, is smell. 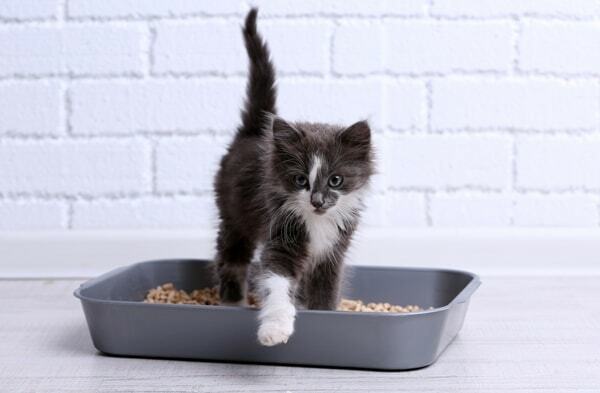 A cat’s ability to pick up odors is 14 times stronger than a human’s. Part of this ability is due to a cat’s Jacobson’s Organ. Located in the roof of the mouth, the Jacobson’s Organ essentially lets a cat taste scents. Scent guides a cat all its life. 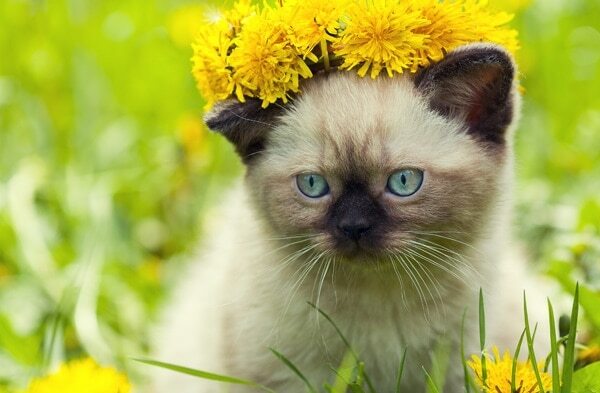 Even though a tiny kitten is born deaf and blind, he can smell odors like a champ. That’s why your cat turns up his nose at scented air fresheners but seems fond of dirty clothes hampers that smell like the kitty’s favorite people. 4. 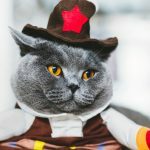 Are individual meows similar to words in human languages? 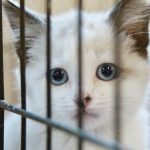 Meowing is a cat-to-human interaction that cats likely adapted from human speech, so why do cats meow? Does each meow has an identified meaning? Have cats developed the equivalent of a human linguistic pattern? Dr. Nicholas Nicastro, Ph.D studied something very similar. He asked if humans could understand individual cat meows. For instance, could a person determine if the animal was asking for food, attention, or something else? 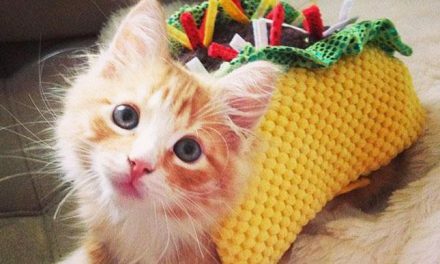 In 40% of cases, experienced cat people could indeed interpret why the cat meowed. Dr. Nicastro could even detect certain meowing patterns that stayed consistent from cat to cat. A short meow is a greeting, for instance, while a long and drawn-out one is a command. It would seem cats have developed a type of feline linguistics that mirrors human language in some respects. 5. Do cats use different meows when communicating with different people or other animals? Unlike dogs whose vocal tenor varies according to size, cats are all similarly-sized creatures who still have distinct voices. 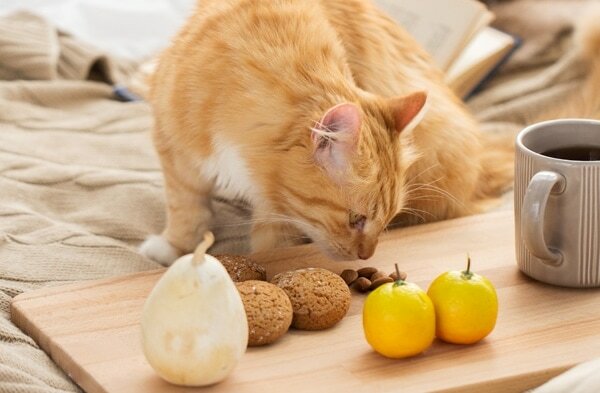 Many factors work together to make your cat’s meow what it is. For one thing, cats have a second set of vocal cords that lets them purr. Their voices also depend on genetics, cord length, and age. Cats may even have regional accents. 6. Are there subtleties to meows that are out of human hearing range? Unlike elephants whose rumble is so low human ears can’t pick it up, cats don’t vocalize outside human hearing range. They can, however, hear much better than either humans or dogs. Not only can cats hear the rustle of a treat bag from across the house, but they could hear it five times farther away than we ever could. Their ears are so precise and attentive they can determine the size and distance from its prey in .06 seconds. Plus, they can hear much higher frequencies than humans can. There’s no evidence that they are meowing at those same piercing pitches, though. 7. Which cat breeds meow the most? 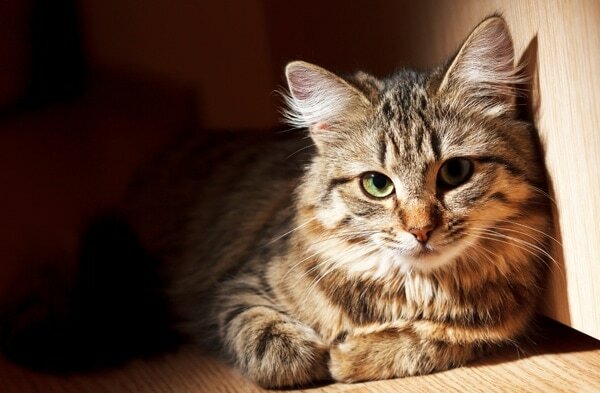 Some cat breeds tend to have low-key personalities and quiet voices. Others are more extroverted. 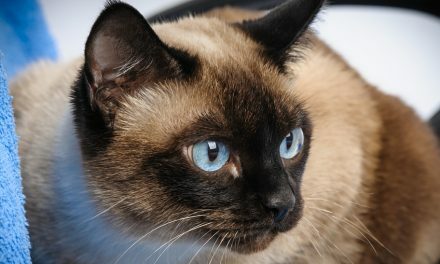 Nearly any list of the most talkative cat breeds includes the Siamese, which many people say is the chattiest cat breed. Others that usually get named are the Burmese, a close genetic cousin to the Siamese, and the Tonkinese, which is a mix of the two. 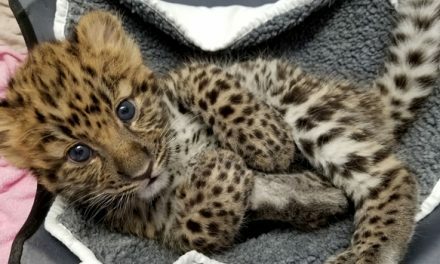 Other big talkers include the Siberian, a large breed that has the broadest vocal range, and the Turkish Angora, which is most famous for its love of water. Having any of these or other talkative types in their genetic background may explain why your mixed breed cats meow. 8. 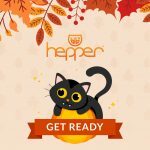 How should I react to my talkative cat? You can’t control your cat’s meowing, but you can manage your own responses to it. 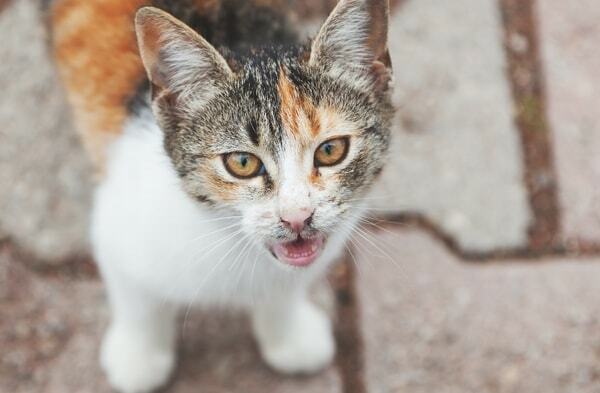 Determine why your cat meows before you act. A quiet cat who suddenly starts vocalizing may be in pain or distress and need a trip to the vet. Another cat may be meowing often because it’s bored. In that case, show your kitty a little extra love. If you think your cat is being an attention hog, you can try ignoring her. Most cats will curtail excessive meowing if given plenty of food, toys to play with, and windows to see out of. Does your cat meow? Is it around food time, or are there other situations that they like to talk to you? Let us know in the Reply/Comments section below! Just so you know: We are a participant in the Amazon Services LLC Associates Program, an affiliate advertising program designed to provide a means for us to earn fees by linking to Amazon.com and affiliated sites. Thanks for clicking the links – it helps us pay the rent! My Russian Blue boy has a very distinct meow to let me know he has used the potty box and it is now time for me to scoop it. We keep a VERY clean box in our house.